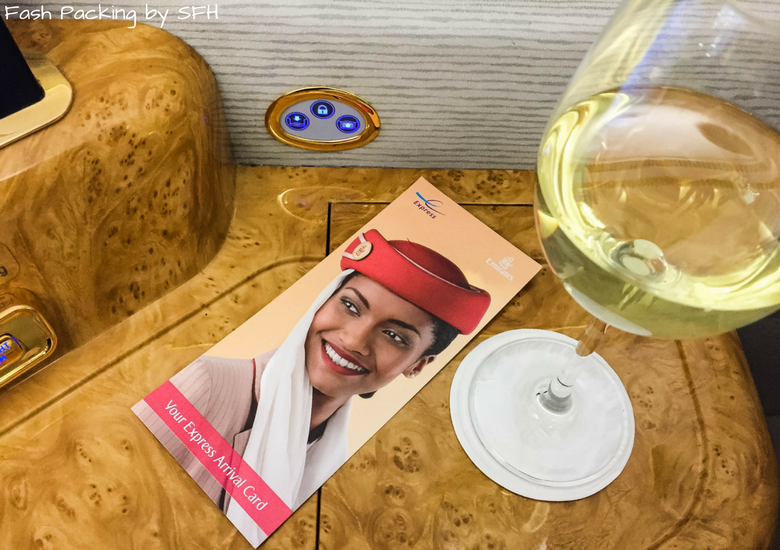 We flew over to New Zealand on Emirates A380 business class so we had already had a little taste of the good life but were expecting the next level on Emirates A380 first class. Passengers are offered a complimentary chauffeur service on every sector but the trans-Tasman route we took. Dejectedly we drove our hire car from Airport Rentals to Auckland airport ourselves. I’m not going to lie. I was disappointed not to be able to sample the full experience and I think Emirates should reconsider this exclusion. The last stop on our road trip through New Zealand’s North Island was in Hamilton. We miscalculated the drive and found ourselves at the airport at 12pm; very early for our 4.30pm flight. Check in should have been as smooth as silk with a dedicated first class queue but it was a debacle. I have never been this early for a flight in my life and was surprised to the find the check in counters wouldn’t open for another hour. We had little choice but to cool our heels with the masses in the extremely crowded airport. People started gathering at the start of the queues at least half an hour early and the impatience was palpable. Two economy and three business counters finally opened 15 minutes late but the first class queue remained closed. We were less than amused and so were the other two passengers trying to check into first. After a further 20 minutes standing in front of an empty desk and glaring pointedly at the closest attendant serving business, she finally took pity on us and starting serving our line but there was no warmth in her manner. When we left there was still no one serving the first class queue and no explanation was offered. New Zealand exit procedures should have been streamlined with our first class express status however we were not provided any instructions on how to use the pass so we just followed the crowd. The Hubs’ passport did not work through the e-gate and he was pulled aside for ‘special assistance’. By this point I was extremely frustrated and so distracted I forgot to throw out the liquids in my carry on which caused further delays at x-ray. Needless to say all this provided a less than stellar first impression, but my mood improved significantly when we entered the lounge. 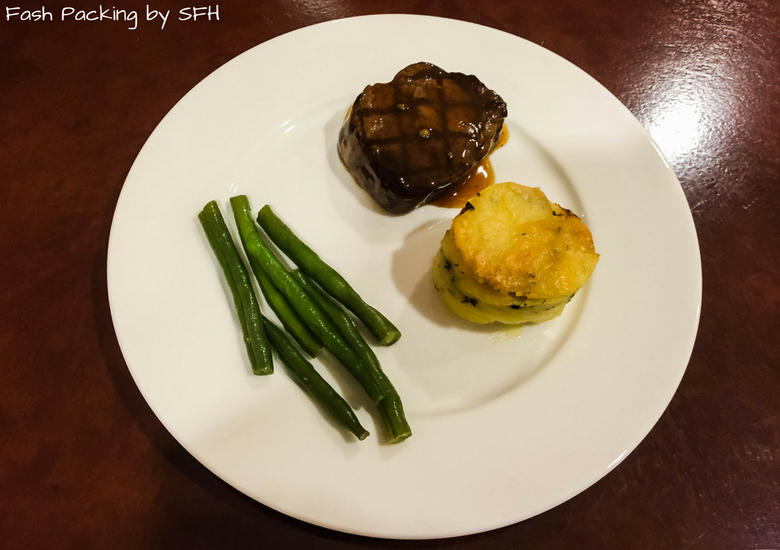 Our experience at the Emirates lounge at Auckland International Airport was sensational. So much so, that when the announcement came over that our flight was delayed I was secretly delighted. Any delay would normally send me over the edge but more time sipping premium champagne and feasting on delicious food is never a bad thing. We boarded about an hour late through the first class only queue. Be warned: you will have to push past hundreds of other passengers milling around blocking the way. Once past the crush, I felt a frisson of excitement as I stepped on board the upper deck of the behemoth A380 and was directed left rather than right. I knew I would soon be getting a glimpse of an experience usually reserved for the elite and I was pumped. My lovely attendant escorted me to suite 1E and The Hubs’ got the same treatment on the way to 1F on the other side of the aisle. Emirates have three configurations on their A380’s and ours was a 1 x 2 x 1 set up for just 14 guests. The cabin is dominated by glossy light wood paneling which is not to my personal taste but is no doubt intended to convey a sense of luxury. 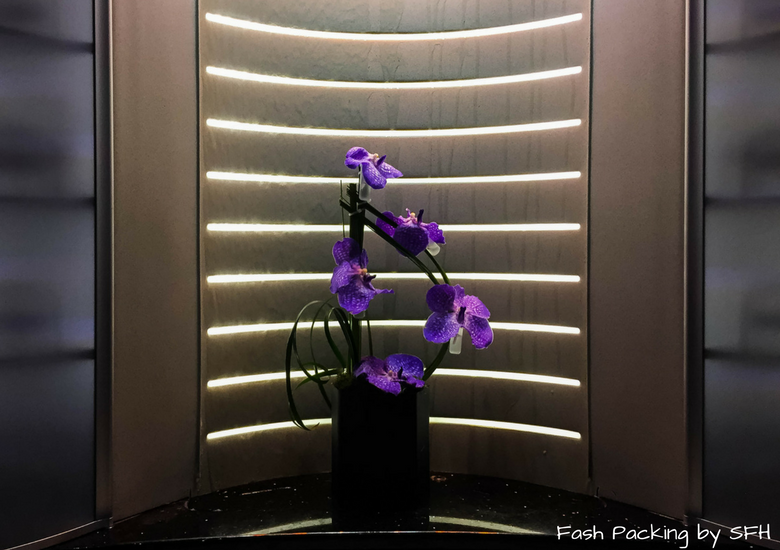 Gold signage is prominent, fresh orchids adorn almost every surface and and there is even a water fountain. At the front of the cabin between the restrooms are the stairs that lead down to business. 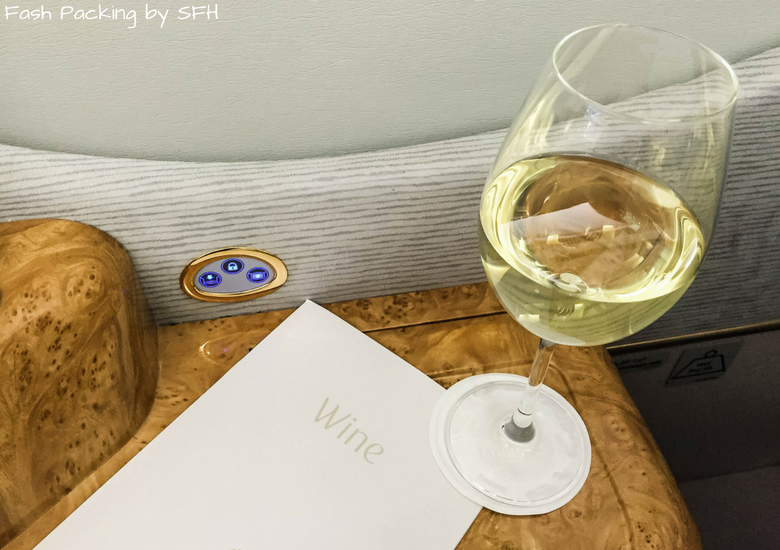 First class passengers are free to enjoy the unique facilities provided in Emirates A380 business class including the fabulous bar. 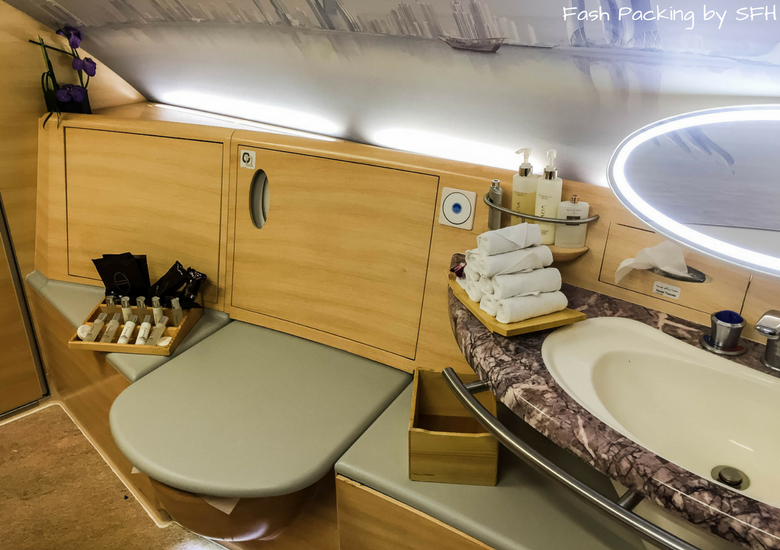 The spa suites in the Emirates A380 first class cabin have to be seen to be believed. Like nothing I have ever experienced in flight, the first thing you notice is the amount of space. 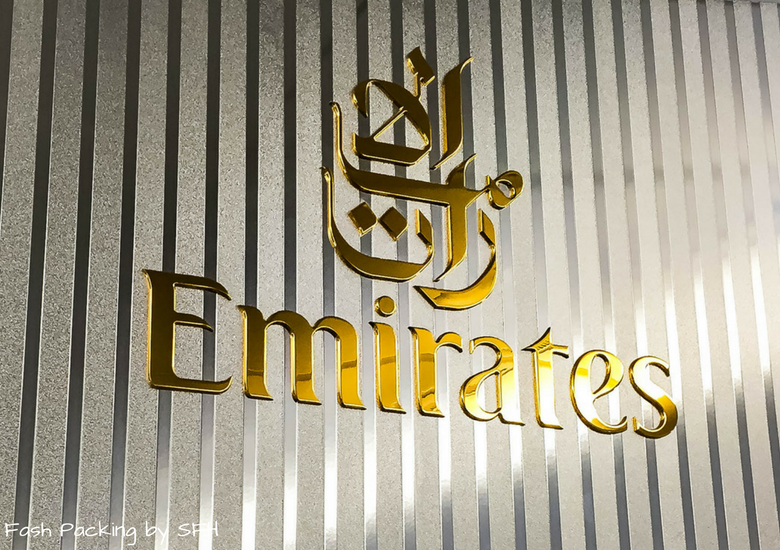 Emirates have cleverly taken advantage of the curvature of the A380 upper deck which is not suitable for seating and turned it into something amazing. I’ve been in hotels with smaller bathrooms! Those wanting to join the mile high club will certainly appreciate the generous proportions (not that I’m advocating this!). The toilet is discreetly hidden beneath a padded lid that does double duty as a seat and there is a full sized sink. 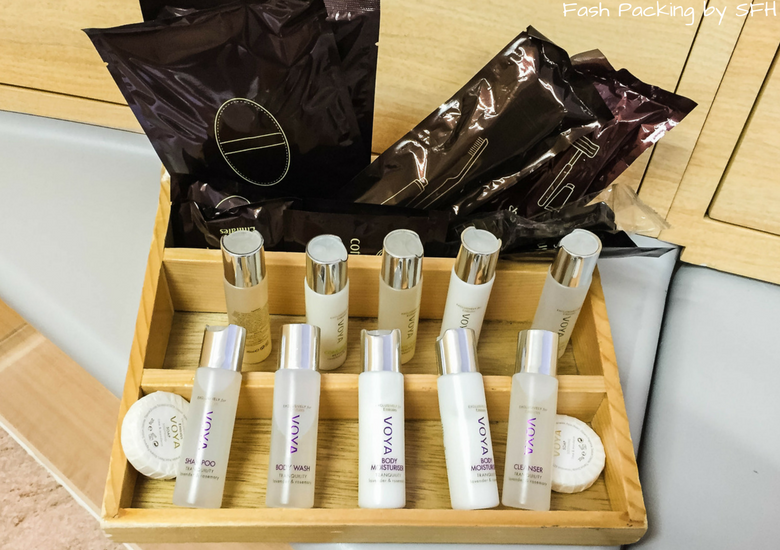 Premium toiletries are provided by Voya and of course proper face cloths are the norm. 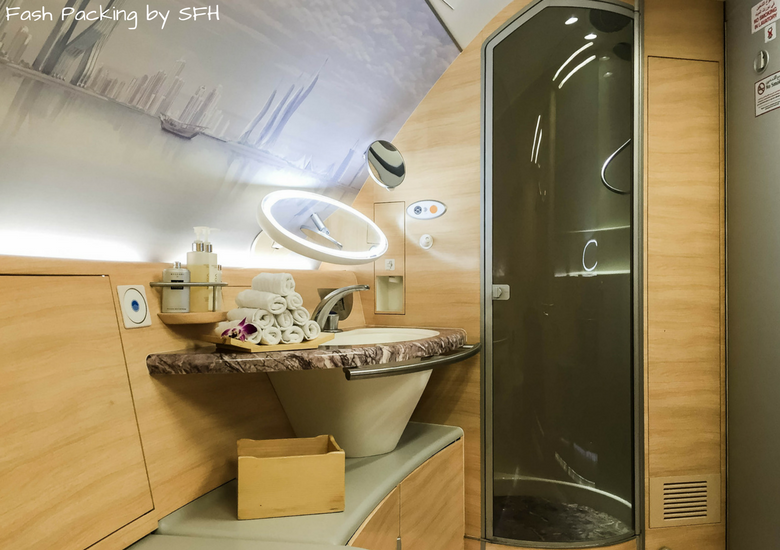 There are only two airlines in the world that offer in-flight showers and this was a deciding factor in choosing Emirates A380 first class. It’s ridiculous I know, but the novelty appealed and despite our short flight (3 hours) I was determined to get wet. My flight attendant prepared the room especially for me and laid out everything I needed. The cubicle itself is more spacious than you would expect and the wand is full sized. 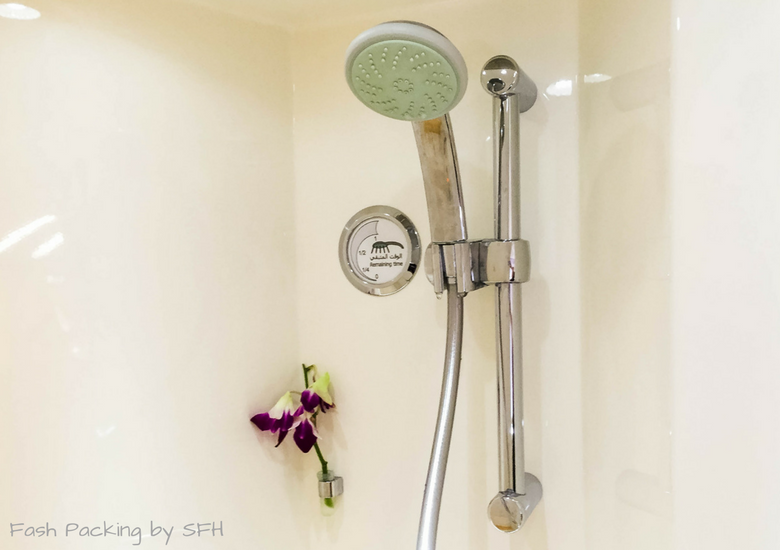 You are limited to 5 minutes of hot water and there is a handy gauge to ensure you don’t get caught in a soapy mess. You can stop and start the water for maximum efficiency but my controller was a little bit temperamental so I gave up trying. 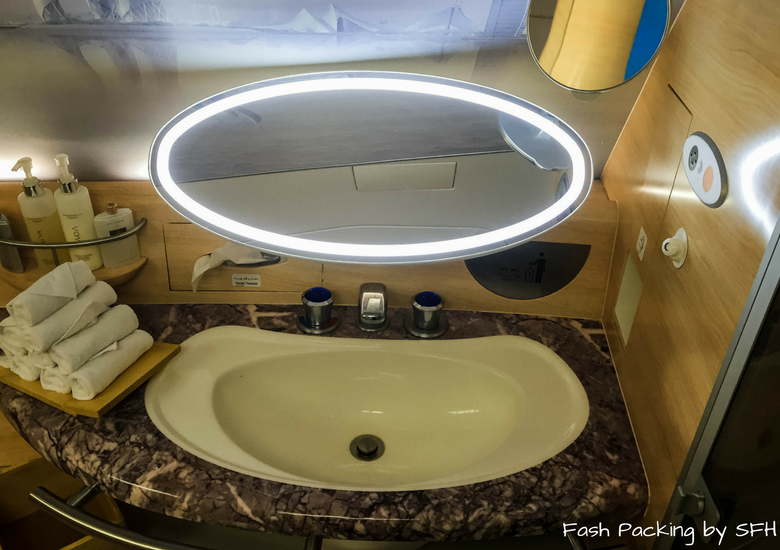 I loved every second of my inflight shower! It would be blissful on a long haul flight to shower minutes before landing and arrive fresh and revived. Yes I said suites not seats. 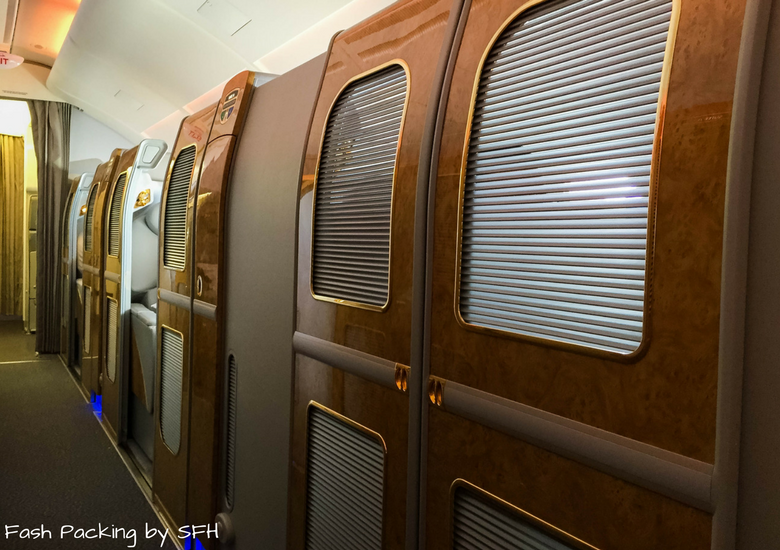 When you fly Emirates A380 first class you get a personal suite equipped with closing doors for complete privacy. This is as close to flying in a private plane as I am ever likely to get! The middle suites are perfect for couples as you can drop the divider to converse and pop it back up again when you have had enough of each other. 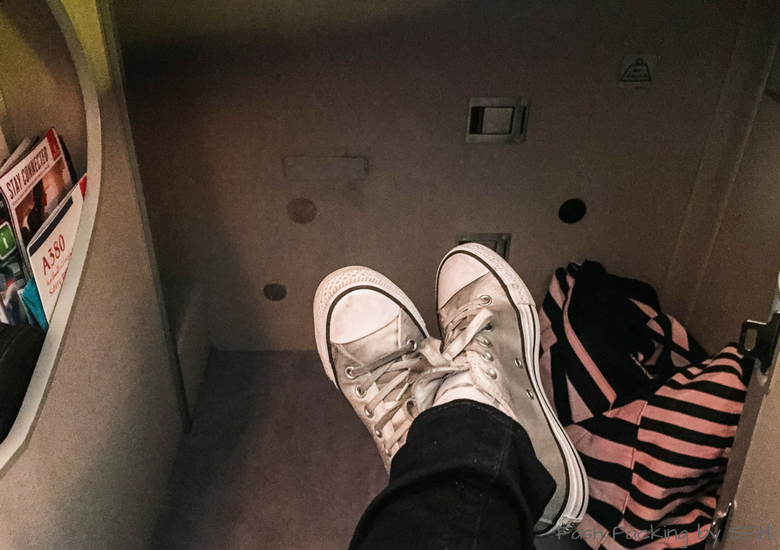 Solo travellers are better off choosing the stand alone suites with a window. 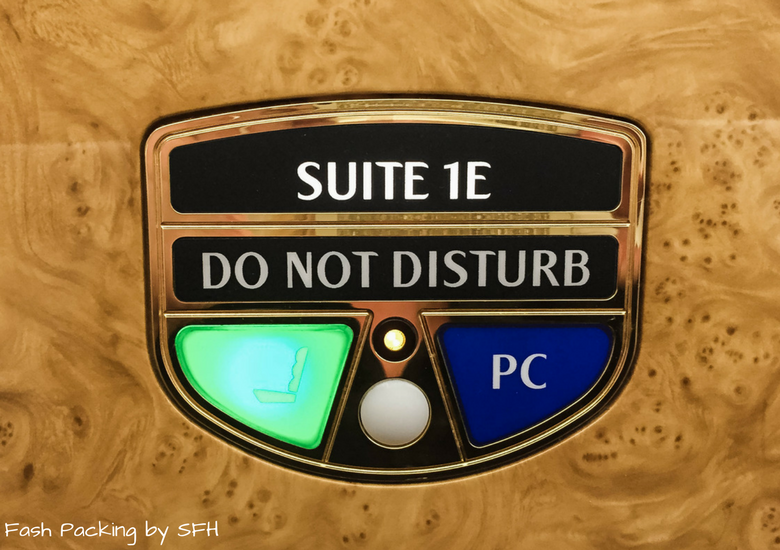 These suites are the bomb! Guests will be delighted with the individual pamper packs, personal bar and thoughtful snack basket. A writing kit is provided and two lights on either side of the screen are a nice touch. There is ample leg room and you would have to be a giant to touch the end. The comfy grey leather seat has 7 different components which can be all adjusted individually to ensure you find your sweet spot. There is a super handy one-touch adjustment to morph your seat into fully flat bed and the helpful attendants will make your bed on request. Had this been a night flight I have no doubt I would have enjoyed a very comfortable slumber. 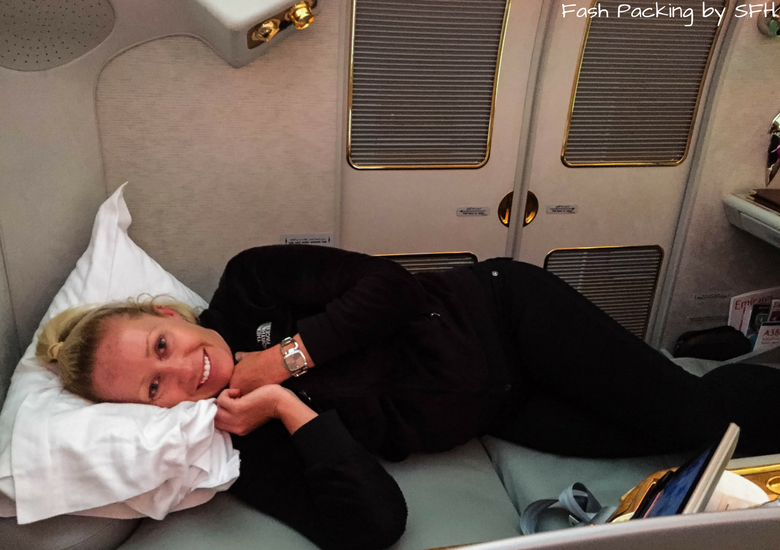 Who am I kidding, there is no way I would have wasted one second of my time in Emirates A380 first class sleeping! 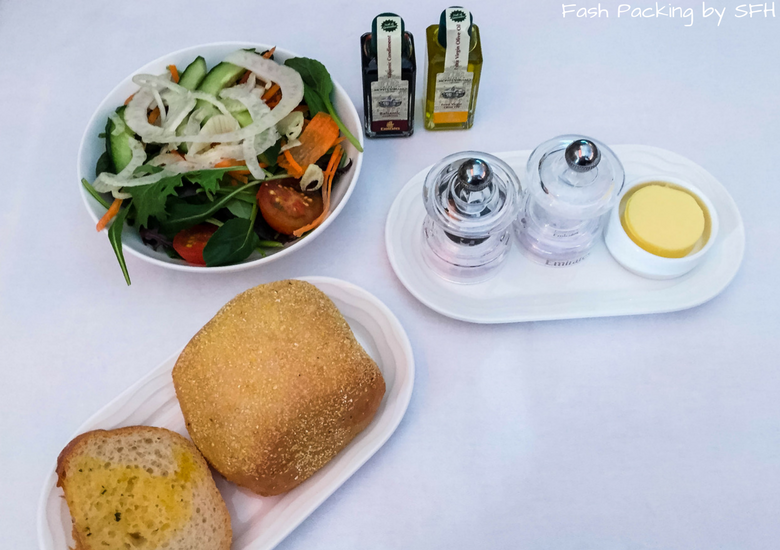 Guests in the Emirates first class cabin are in for a real treat when dinner rolls around. 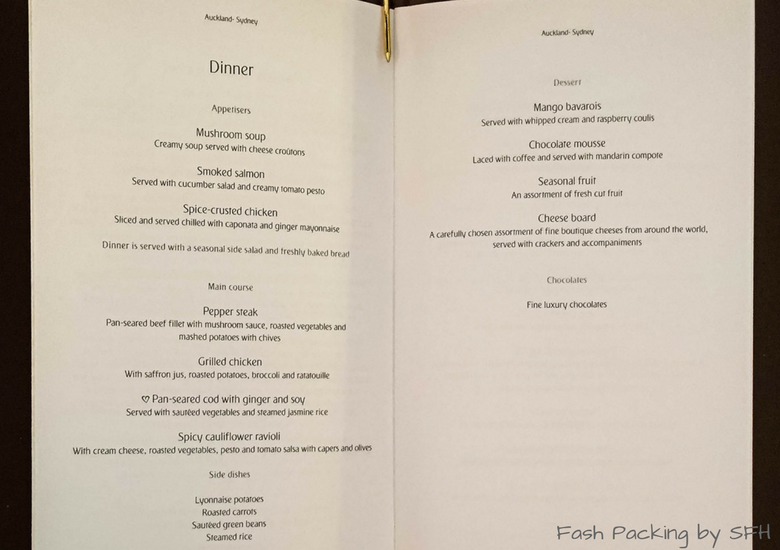 Dining is usually on demand, but our short flight meant that all the meals were served at once. Menus change monthly and three courses are offered, all with a vegetarian option. Each delicious morsel is beautifully presented on Royal Doulton fine bone china with Robert Welsh cutlery. The Hubs’ and I both chose the spice-crusted chicken for entree and pepper steak for main. We went our separate ways for dessert; me with the cheese board while The Hubs’ opted for the chocolate mousse. A section of fresh bread is offered and I couldn’t resist the garlic. The chicken was the highlight as my steak was overcooked and my cheese board arrived sans crackers. I was a little perplexed as to what I was supposed to do with it but this was rectified quickly when I brought it to my attendants attention. I sneaked a bite of The Hubs’ mousse and it was delicious. 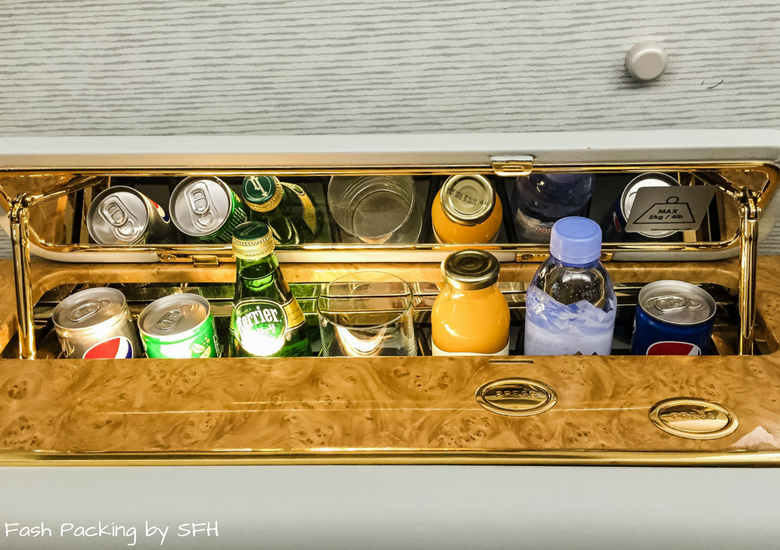 Virtually as soon as you are settle in the Emirates A380 first class suite your welcome drink order is taken. The wine list is tight with only four of each colour on offer, but they are all top shelf. On top of the delay in the lounge, we had an extended delay on the ground while a baggage loading issue was sorted out. I didn’t mind one little bit and I sampled three of the whites on offer before we had even taken off. 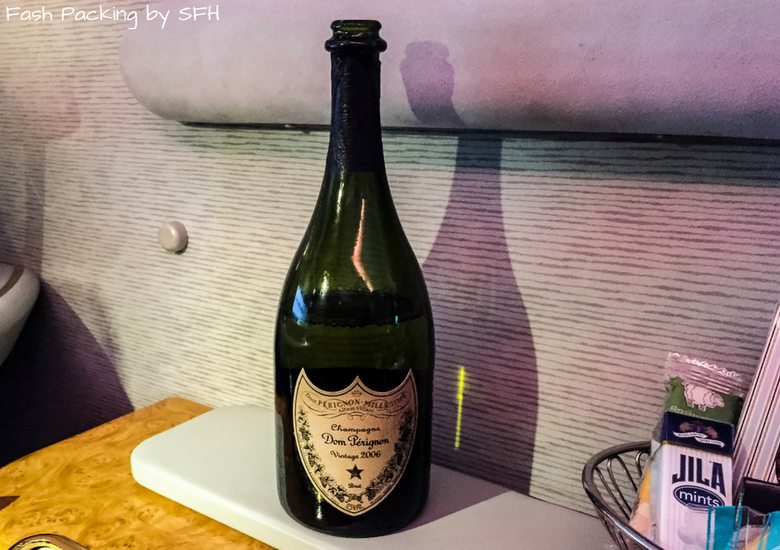 I have never been a big fan of Champagne, but that all changed when I tasted the 2006 vintage Dom Perignon served in Emirates first class cabin. It was superb and I downed almost a bottle before I touched down in Sydney. A selection of cocktails were also on offer and I couldn’t resist a Mojito. The Hubs was a little disappointed with the beer selection and stuck to Heineken after not really finding anything else to his liking. Once on board we learned the crew come from 23 different countries and speak 19 languages between them. Pretty impressive! 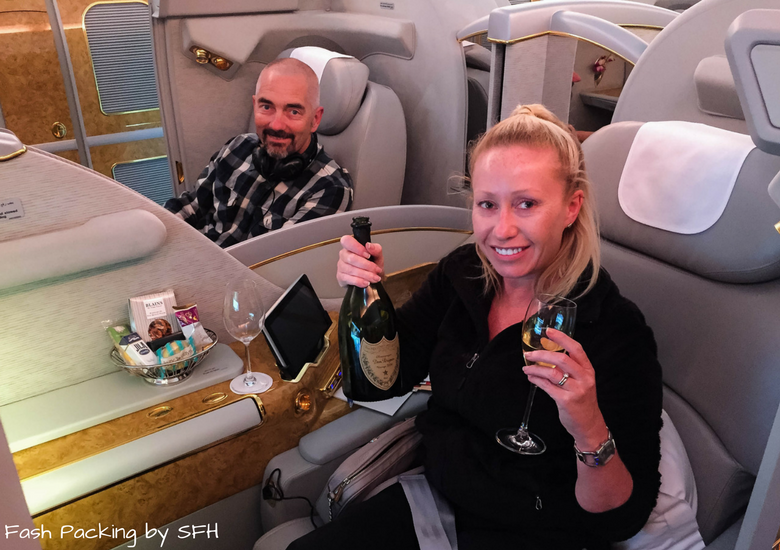 Each Emirates A380 first class suite has a dedicated attendant who will look after you for the entire flight and The Hubs’ and I each had a different one. Mine was certainly more engaging and when she found out it was my first time she went out of her way to make my flight memorable, starting with a full run down of everything my suite had to offer. She even snapped one of the pics here when she saw me struggling to get a decent selfie with a bottle in hand! I’m not sure how many attendants there were to look after the 14 passengers but the ratio was high and staff were attentive. 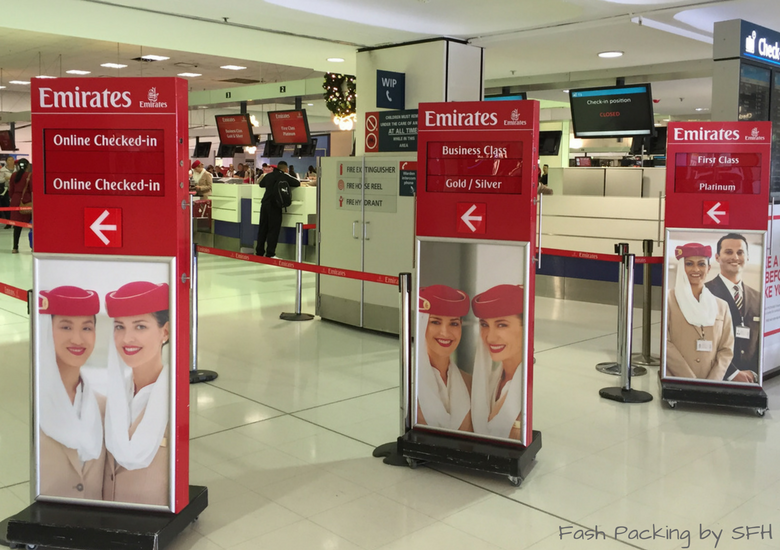 Emirate Airlines first class passengers disembarking in Sydney are provided with an express pass to expedite you through customs and immigration. 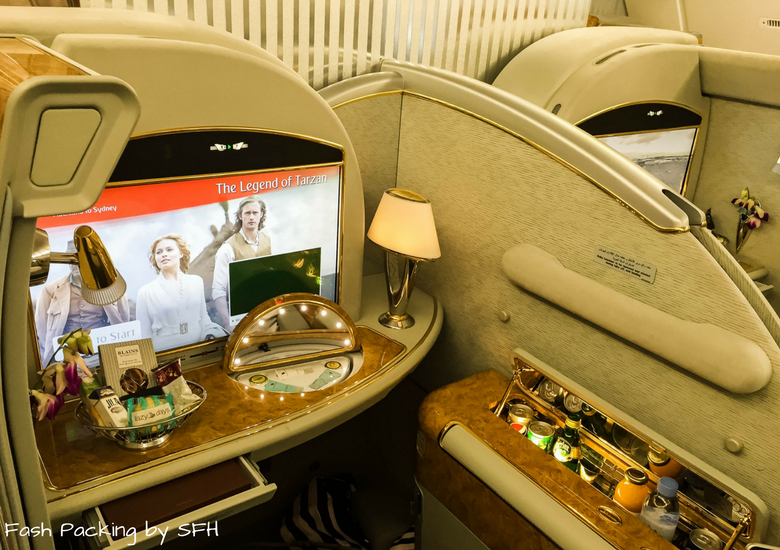 Each Emirates A380 first class suite has a large screen loaded with the ICE system (information, Communication, Entertainment). Our extended delay on the ground meant I managed to get through two movies on our trans-Tasman flight and the noise cancelling headphones provided worked a treat on the already whisper quiet A380. I chose to indulge in a couple of chick flicks and Whisky Tango Foxtrot and Bad Moms had me chuckling all the way home. As expected a flight map is included so you can track your progress and you can cycle through the three on-board cameras for a birds eye view. WI-fi is available but it’s insanely slow and really not worth the effort after you have posted that first status update just because you can. 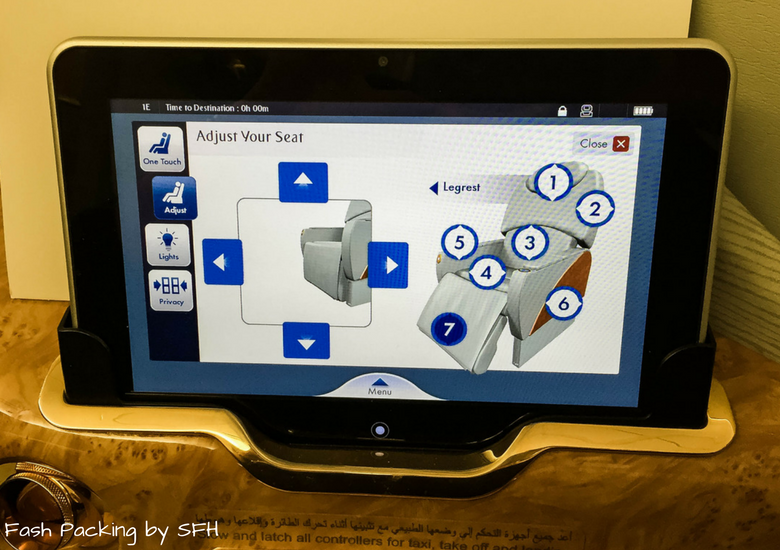 An in seat phone keeps you connected and you can even use your own mobile phone on all Emirates A380’s where reception permits. Of my many flights, only a few are memorable. That trip at 8 I mentioned earlier, flying Sydney to Honolulu where a toddler close by screamed for 9 hours straight, a solo flight on Japan Air Lines to Osaka where I had virtually the whole upper deck to myself, a generous upgrade to business class on Cathay Pacific from London to Sydney and flying on my first A380 with Qantas from LA all spring to mind. My Emirate Airlines first class flight has joined these ranks for all the right reasons and has reminded me of the joy of flying. 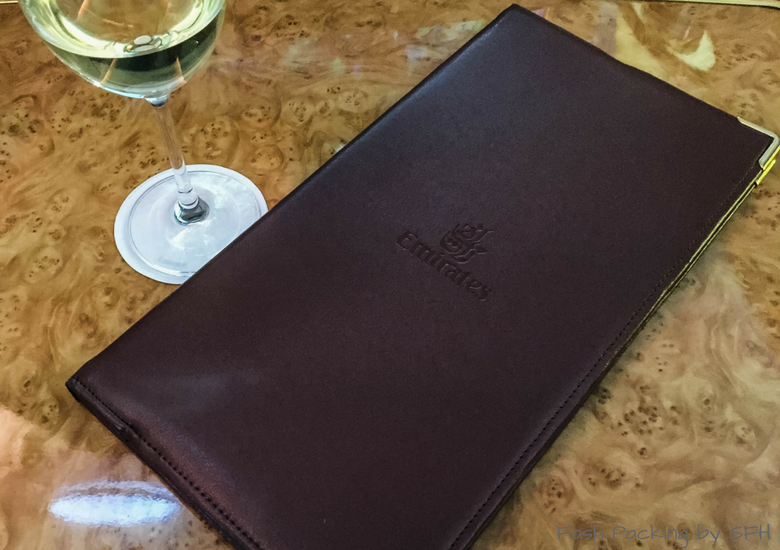 While we had a rocky start, Emirates A380 first class has forever spoiled me and was the perfect end to a fabulous week in New Zealand. 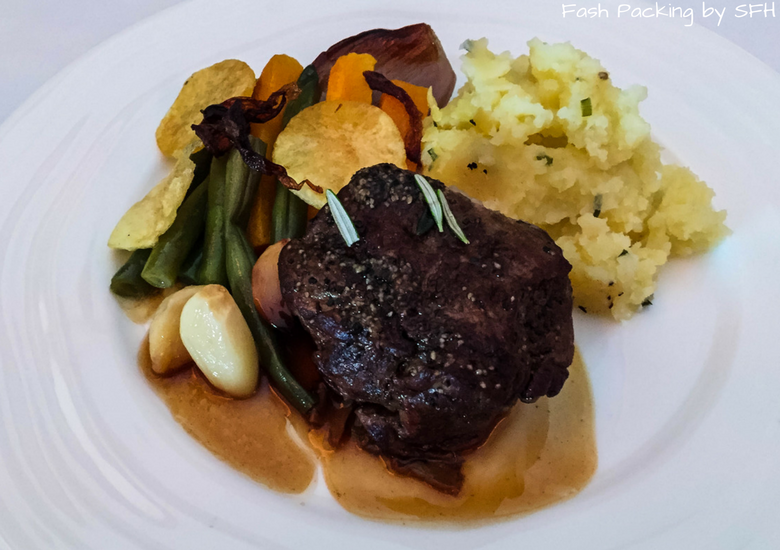 If you are heading to NZ for the first time you should read my New Zealand essentials post which has heaps of helpful information to help you plan an unforgettable trip. 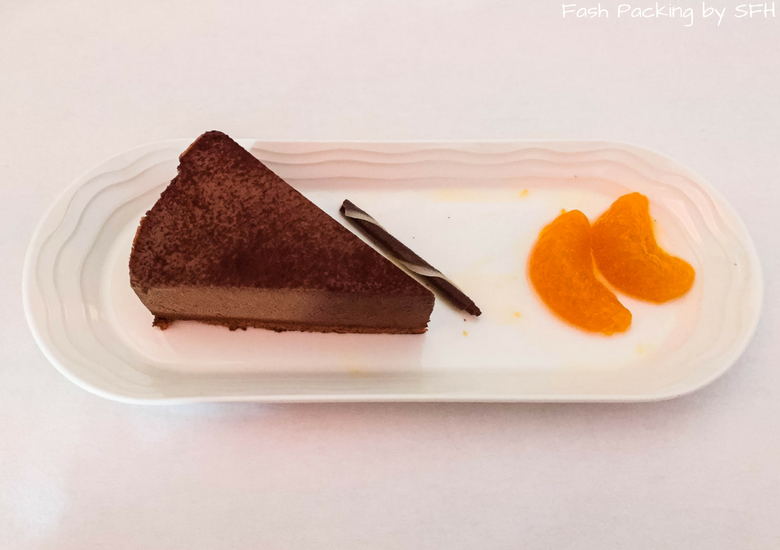 Have you travelled on first class? 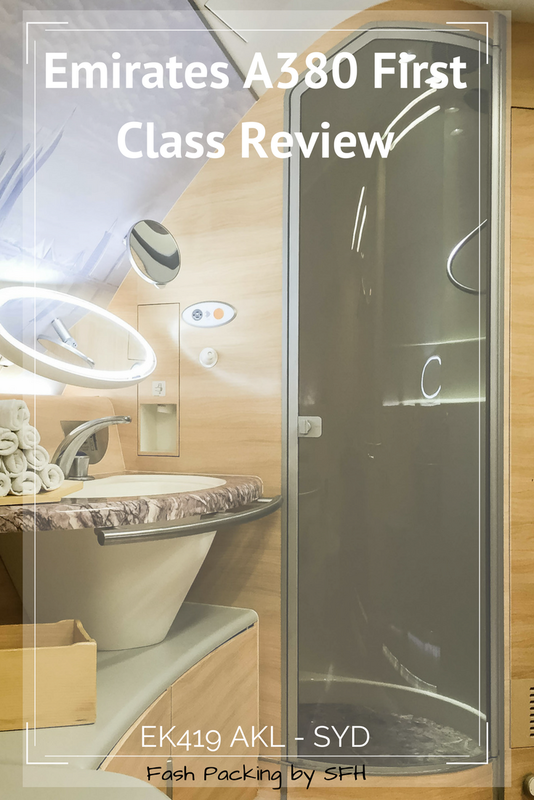 I would love to hear about your thoughts on my Emirates A380 first class review in the comments below. Disclaimer: This post is not sponsored. 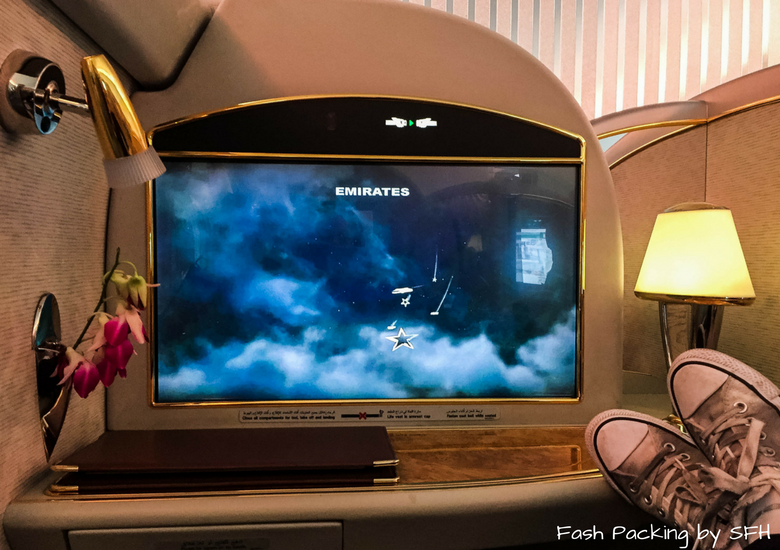 I paid for my Emirates A380 first class flights using frequent flyer points. As always, all opinions are my own. I am considering booking EK419 SYD/BKK in First using QFF points, sounds like it may be worth the splurge, a shower at 40,000ft would be enough to get me to drop the points. 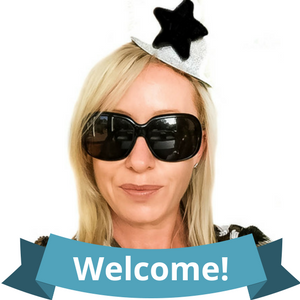 Thanks to status upgrades, I travelled first class on BA, Cathay, Thai, Singapore and Qantas several times for work years ago (pre A380 era) and can assure you it was nothing close to your experience. 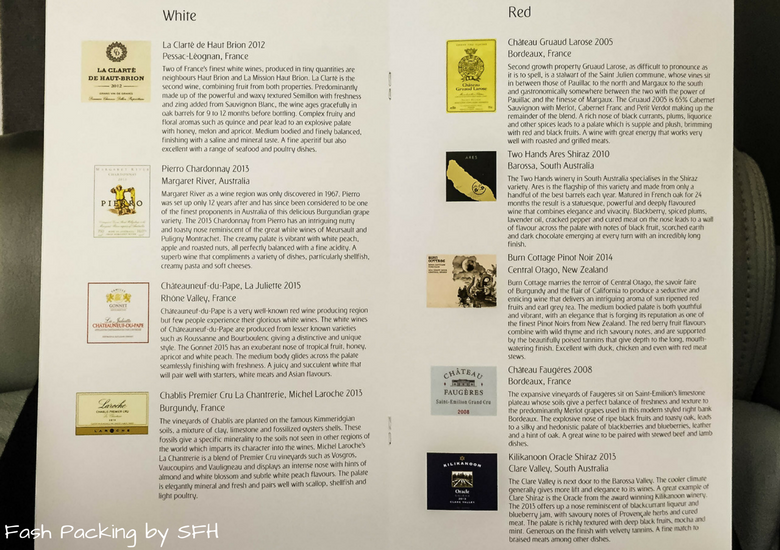 Highlights from back then were a flat bed and duvee on Qantas (SYD/BKK) and the toast from a toaster on Cathay (HKG/SYD) along with their caviar entree service. I could certainly pass on the high quality padded Singapore Givenchy mustard with chocolate piping leisure/sleep suit. 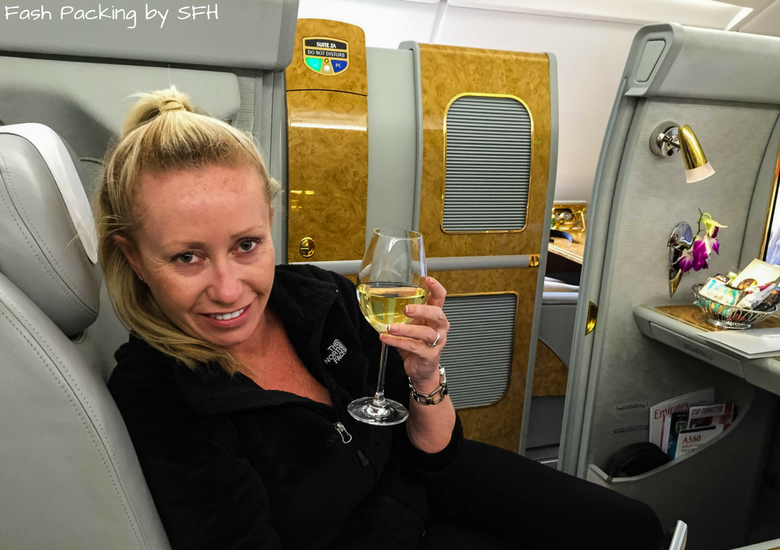 My highlight was by far BA SYD/BKK where I decided to blow a bunch of QFF points to book 4 first class seats for a family vacay (only seats available for my dates). After turning left we never saw nor heard another person for next 9 hours, except our very attentive attendant, abandoned by his 2 first class colleagues who, after checking it was OK with me, went down the back to help out. 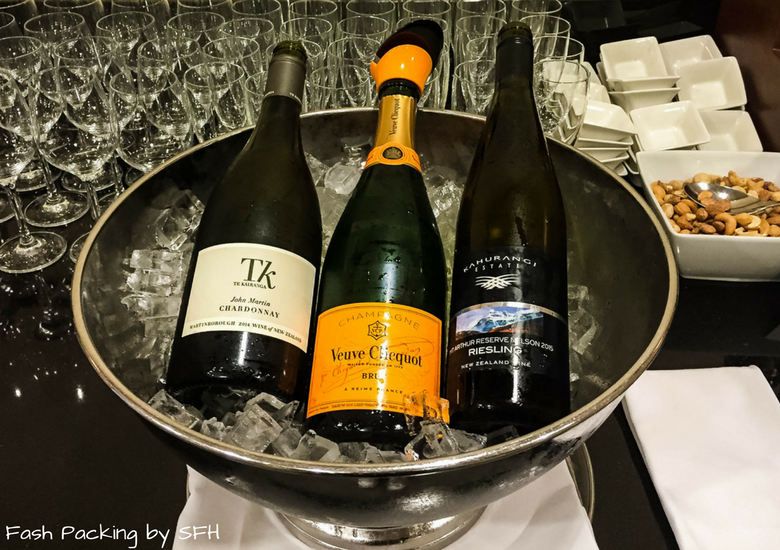 Given the day flight and the unusual circumstances Andy decided the usual order taking and service routine was redundant so he set up the table and proceeded to serve everything on the menu from top to bottom including the wine list, so we enjoyed some sort of mile high degustation. It didn’t take long to completely forget we were on a 747 with hundreds of passengers and a full crew. I have no idea how often this happens but remember it as one of the most bizarre and decadent travel experiences. Thanks for the great review of Emirates, I look forward to reading the others. That sounds amazing Scott! I’ve built up a bunch of QFF points again and I’m looking at where to go later next year. I’ve got travel booked to March already. I think the next flight might be business though sadly. Wow, you did all that in just 3 hours (plus delays)??? I just read your VietJet review before checking out the First Class experience, and couldn’t help noticing the differences, haha! I’ve never flown first class, but when I do I just know I’m going to be too busy trying everything out to rest!! It looks amazing! 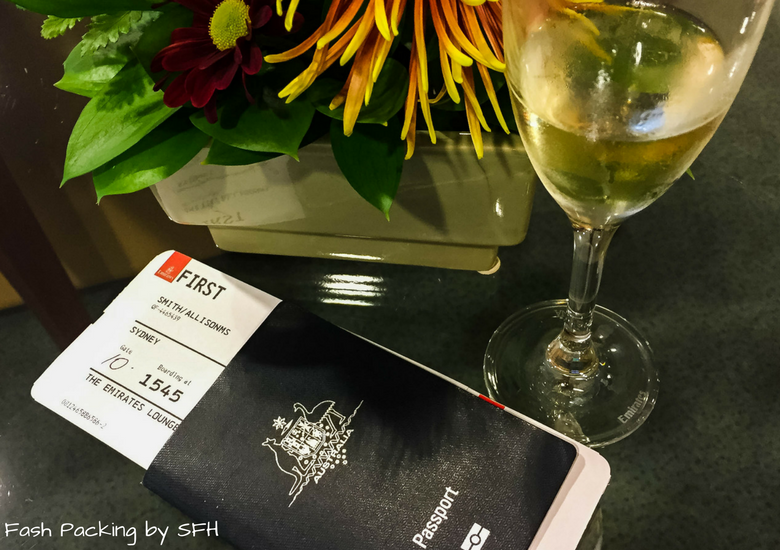 Flying first class is on my bucket list – even if it’s just once! Yep! I wish it was longer ? Wow, what a great experience. Once on the airbus we were offered a tour of first class, but never got to stay there or try out the amenities. It’s gorgeous. Jealous of the chance to try out the shower. That was nice that they let you have a peek in first! I also glance left when I’m boarding just to check it out but after this trip I’m well and truly sold! Wow! So I’ve never flown first class but this looks like the best way to do this. I can’t believe there is a place to actually take a shower on a flight. 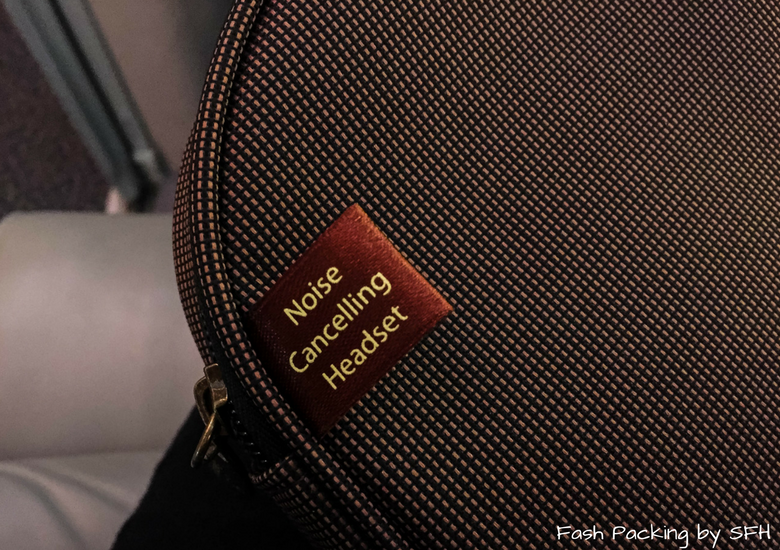 I would have appreciated that on a recent trans-pacific flight I took. Between the quality of the food, the amount of space you have, and choices in booze, it doesn’t even look like you’re on a plane. Hopefully, I’ll get a chance to try it out someday. Thanks for the inspiration. It was brilliant Meagan. I didn’t want to get off! Holy cow, this is incredible! 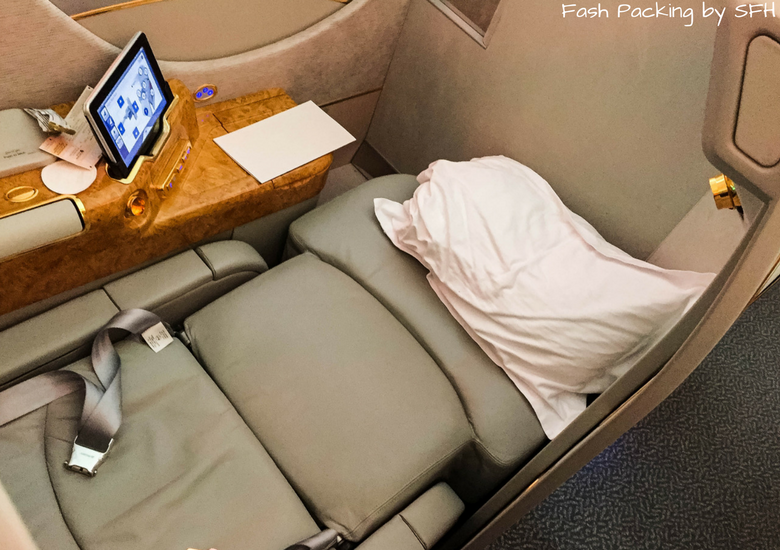 Thank you for giving us an insider’s view of what it’s like to fly first class. I’ve never flown first class (like others here), but the fact that Emirates has showers (so cool!) 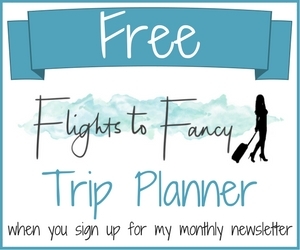 is swaying me toward booking with them once I build up enough points! I also love that you had 2006 vintage Dom Perignon. Now, if only I could find a bottle of that for my birthday… ha! As soon as I got home I searched online for this particular bottle of Dom Julianne. Not easy to find but I did track one down at $210 a bottle. Save that for a special occasion like your birthday for sure! I didn’t buy it but I still might lol. Unfortunately my birthday has just gone so I will need to find another excuse! 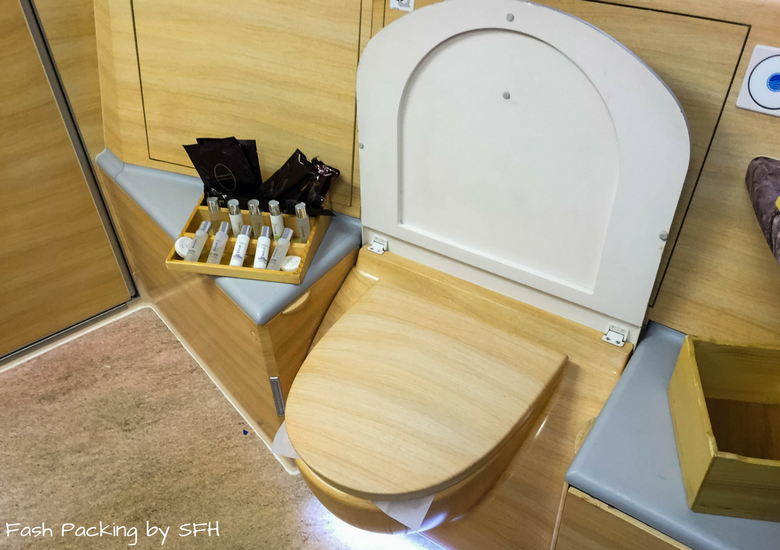 Oh wow, I knew First Class was fancy but this looks next level!! The start definitely sounded frustrating but I’m glad the luxury made it worthwhile. I agree with you when you say flying has lost the luxury and excitement it once had but if I could afford to fly first class all the time I’m sure it would be quite a treat! Maybe it’s a good thing we don’t get to do it all the time Sasha. I would hate to feel as jaded about this special experience as I do flying in general. It was sensational and I’d love to do a long haul trip. Wow I have never seen a first class cabin like this before. 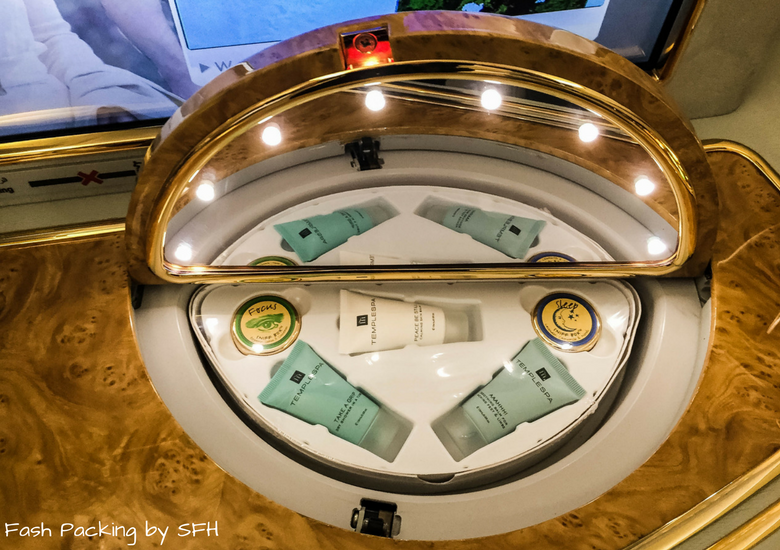 It would almost be sensory overload for me – I’d be conflicted between sleeping (which looks super comfortable there, and I love sleep) and eating all the food and pampering myself at the spa! I can only imagine how much this would cost, but wow what an experience for you! This sounds like an absolutely incredible experience! I always think that I will know when I’ve “made it” in life as I’ll be sipping champagne in first class on an Emirates flight haha. Right now I get excited enough when I can just about afford to fly economy with Emirates, least of all business class and beyond! Other than the less than desirable start, this sounds like an absolute dream. I want a mid-flight shower!!! I remember the excitement of my first plane ride as well, oh how I wish I could feel that again! My budget never allows me to fly first class but I hope some day it does 😉 That bathroom is out of this world, I love the shower selfie haha. I really wouldn’t mind flying a long haul first class!! You can only ask Jenni! Never flown economy in Emirates only biz and first. You’ll have to let me know what it’s like! 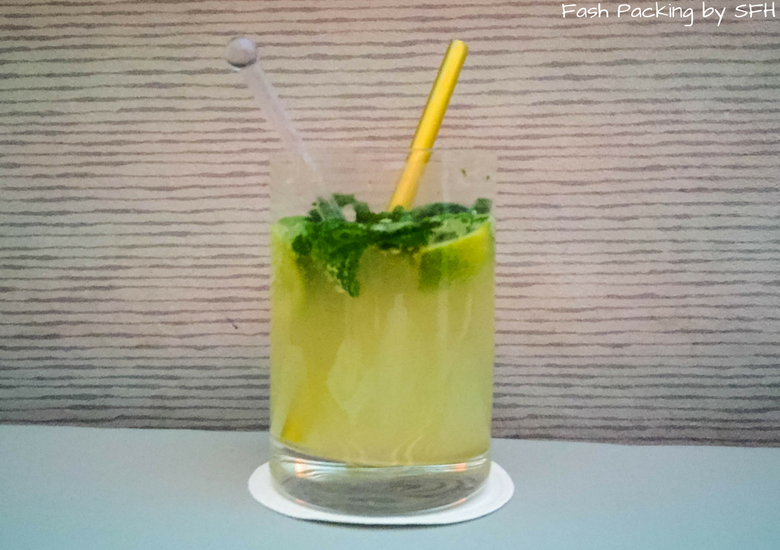 I have never flown Emirates, but those first class suites look divine! The shower is such a decadent perk. I regularly fly first class domestic and first/business only for international. There is simply nothing better than the first class lounge, special boarding, bigger & comfy seats, plus the food service. Wow, such a great experience. I have never experienced first class, I’m so jealous. I can’t believe they have showers on flights. I too would insist on trying these out however short the flight was. Hopefully one day I will get to experience this. I’d better start saving my points. It was a blast Kathy! Loved every minute of it. If only I could fly like this all the time! I must admit – as I was reading this , I kept on saying Wow! 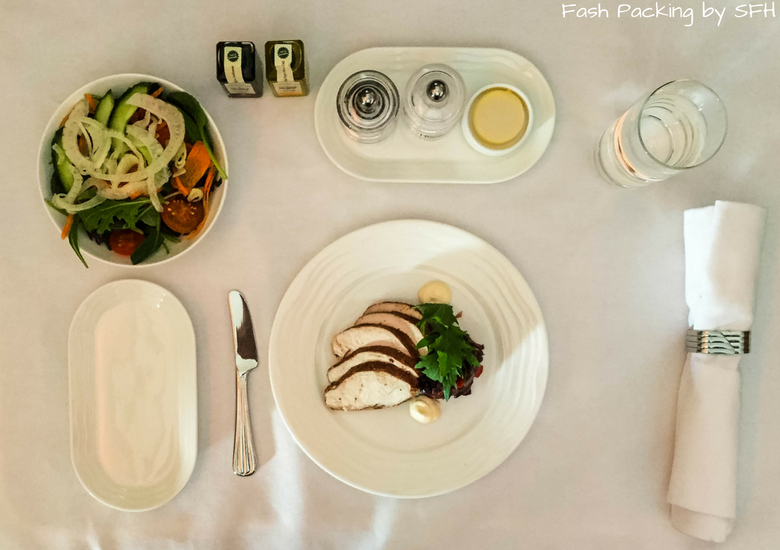 Having your own private suite on a plane, a shower and meals served in bone china all scream luxury. I’d love to experience it someday. Going back to normal flights again will be difficult I’m sure. It will Sara but I’m back in coach next month. In fact the next 4 trips I have booked are all in coach ??? Ha, I’m saving up my points with the hope of experiencing this one day as well, even for a short flight! Got upgraded to First once when flying Delta from Canada to the US, but it was nothing like that. Can you imagine making a go of it on a leg (or both!) on the Sydney to London flights?! On a side note, thoroughly enjoyed Whisky Tango Foxtrot as well! I’m hoping to be able to at least have enough for business return to London in 2019. Fingers crossed ? 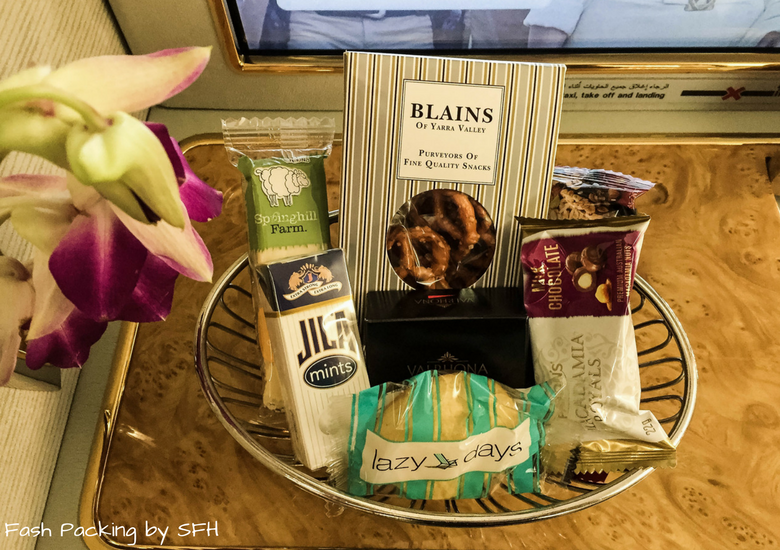 I’ve never been in first class – what an experience! 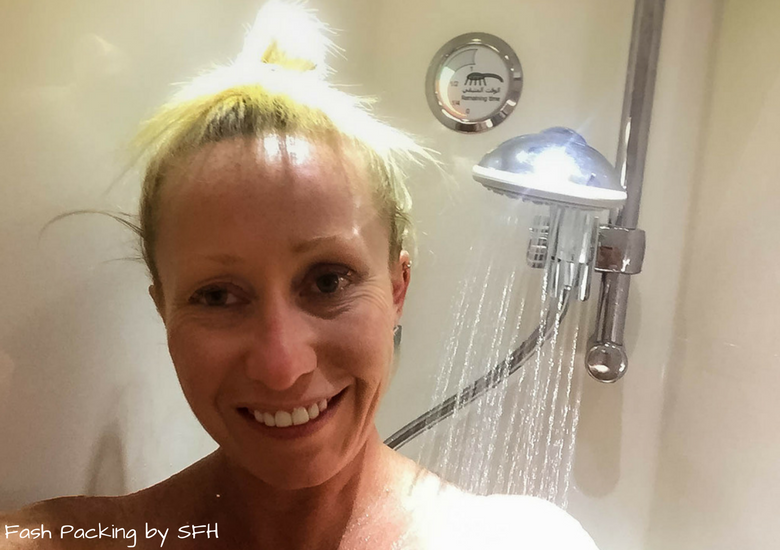 Showers and private suites – I showed your post to my wife and she couldn’t believe it either. 3 hours isn’t long enough for all the perks that you get on that flight, just as well you had a few delays that stretched it out a bit (I’d have jumped in the shower too, just to experience it). Oh…the good life! Lucky you. Great post. Thanks for sharing! The delays were very welcome! If only I could afford to fly first all the time! Wow, just wow. This is some kind of luxury unreachable for 99,9% and indeed obviously something very special. Simply amazing and very impressing to get such a detailed inside view – great post! Thanks Hendrik! This is why we chose it for our return flight. We wanted to have something to look forward to after our week in New Zealand but it absolutely was an experience in itself! Wow! I haven’t travelled first or business class yet but it looks like a dream! Hopefully one day ☺? Start saving this points Carlinn. It doesn’t feel like you are paying for it then even if it is significantly more than the points required for economy! I am officially extremely jealous. This is phenomenal and growing up never expected that flying would ever get so luxurious. 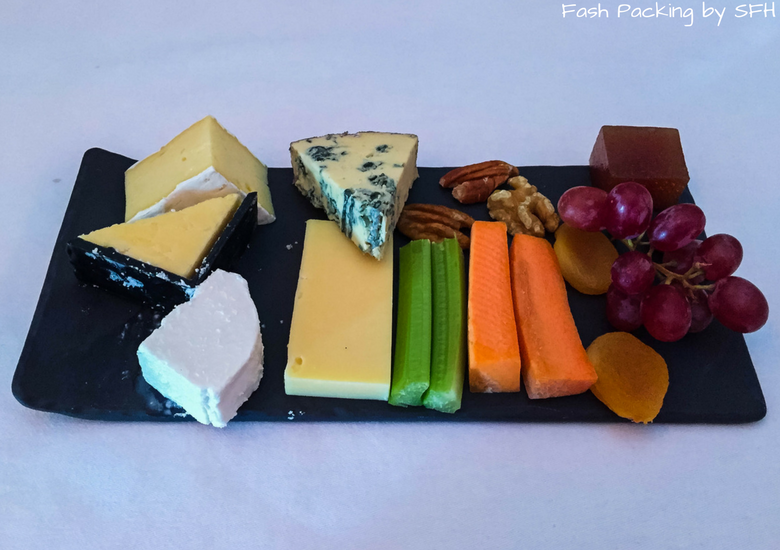 A shower high up in the sky – that’s one to check off the bucket list – and of course the privacy and the food, that cheese platter looks mighty fine. Considering I am an anxious flier, little things like this would certainly help me cope a little better. Very well written and experienced. It would have been very annoying if you’d paid the extra fit the flight and then they were slow to open check in. That’s the time in the lounge you are missing! The people in the way when you went to board, were they the economy passengers? The flight looked amazing, I’d have definitely opted for the shower too! Allison you need to try this on the SYD-DBX sectors. 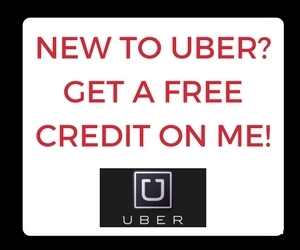 You get even more perks (as well as the chauffeur transportation). Because you fly into their hub it’s extra special. Take advantage of their short stay accommodations and Dubai is amazing. 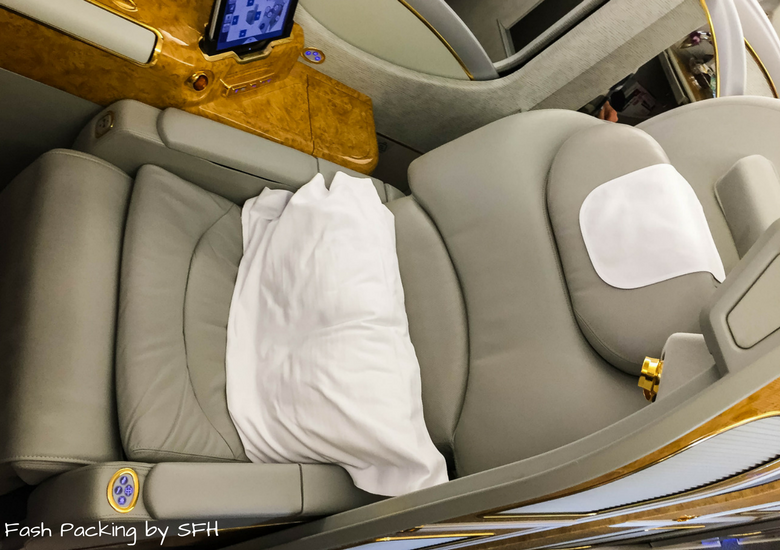 I have flown both business and first on these sectors and will only choose A380 flights for the amazing luxuries you receive in these flights. Did you use the bar area? I live in hope Melissa! We flew over in business so used the bar then ? A380 is the bomb. So quiet. So smooth. If only they flew everywhere! 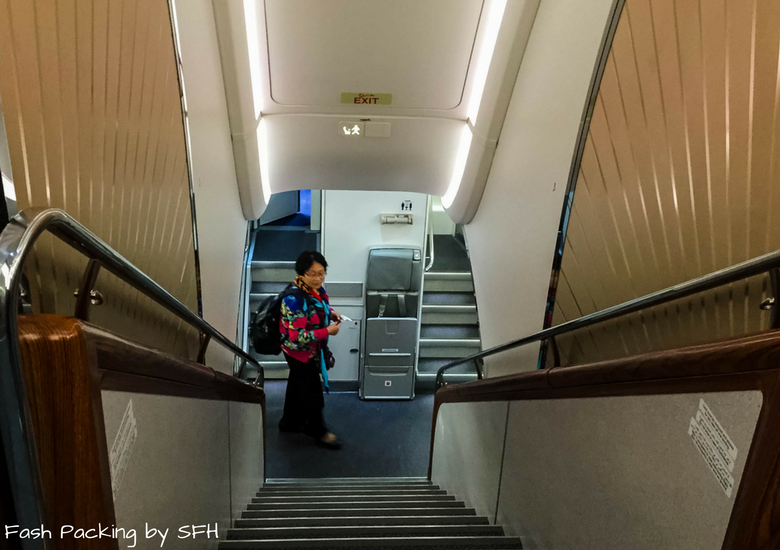 I know… peter is working in Malaysia and Singapore at the moment and his work only provide economy flights but even choosing the economy seats up stairs on the A380 are much better. 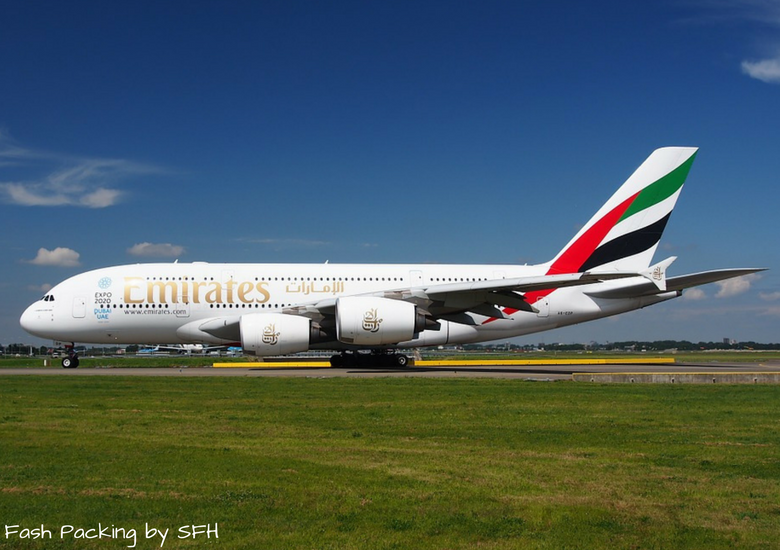 Whenever I fly I always look to see what type of plane it is – especially if it’s emirates! I’ve done Qantas A380 LAX-SYD in business. It was good but Emirates have the edge. I’ve yet to try economy but never say never ? After a rough start, that sounds like a pretty amazing experience! I’ve never flown first class, like you, I go for quantity on flights. I would love to, though. And I would definitely want to shower and sample champagne. Do you think you can go back to regular flights again?